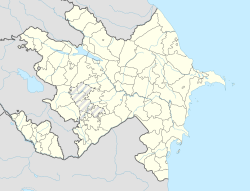 Ganja (Azerbaijani: Gəncə) is Azerbaijan's seicont-lairgest ceety wi a population o aroond 313,300. It wis namit Yelizavetpol (Roushie: Елизаветполь) in the Roushie Empire period. The ceety gained its oreeginal name - Ganja, in atween 1920-1935 durin the USSR period. Housomeivver, its name wis chyngit again an cawed Kirovabad (Roushie: Кировабад) in the USSR period frae 1935 tae 1991. Feenally, the ceety regained the oreeginal name efter Azerbaijan's unthirldom in 1991. Modren historians believe that the name Ganja (گنجه / Ganjeh) derives frae the New Persie ganj (گنج: "treasure, treasury") an suggests that the ceety existit in pre-Islamic times an wis likely foondit in the 5t century A.D. The aurie in which Ganja is locatit wis kent as Arran frae the 9t tae 12t century; its urban population spak mainly in the Persie leid. Accordin tae medieval Arab soorces, the ceety o Ganja wis foondit in 859-60 bi Mohammad b. Khaled b. Yazid b. Mazyad, the Arab govrenor o the region in the reign o the caliph Al-Mutawakkil, an sae-cried acause o a treasure unearthed thare. Accordin tae the legend, the Arab govrenor haed a dream whaur a vyce tauld him that thare wis a treasure hidden unner ane o the three hills aroond the aurie whaur he camped. The vyce tauld him tae unearth it an uise the money tae foond a ceety. He did sae an informed the caliph aboot the money an the ceety. The Caliph made Mohammad the hereditary govrenor o the ceety on a condeetion that he wad gie the money he foond tae the caliph. Foondation o the ceety bi Arabs is confirmed bi the medieval historian Movses Kagankatvatsi, who mentions that the ceety o Ganja wis foondit in 846-47 in the canton o Arshakashen b the son of Khazr Patgos, “a furious an merciless man”. The fowk o Ganja experienced a temporary cultural decline efter an yirdquauk in 1139, when the ceety wis taken bi keeng Demetrius I o Georgie an its gates taken as trophies, an again efter the Mongol invasion in 1231. The ceety wis revived efter the Safavids came tae pouer. Ceety wis an aa managed bi Ottomans atween 1578–1603 an 1724-1735. For a short period, Ganja wis renamed Abbasabad bi Shah Abbas efter war against the Ottomans. He biggit a new ceety 8 km tae the soothwast o the auld ane, but the name chyngit back tae Ganja durin the time. Durin the Safavid rule, it wis the caipital o the Karabakh (Ganja) beylerbey, ane o the fower sic admeenistrative units an principalities. In 1747, Ganja became the centre o the Ganja Khanate. Accordin tae the October 1813 Gulistan Treaty, the Ganja Khanate, thegether wi maist o Azerbaijan, wis recognised as pairt o Roushie Empire efter Persie's defeat in the Persie-Roushie wars except Persian occupation atween 1826-1827. It wis renamed Elizavetpol (Roushie: Елизаветполь) efter the wife o Alexander I o Roushie, Elizabeth, an in 1868 became the caipital o Elizavetpol Govrenorate. Elizavetpol wis an uyezd o Tiflis Govrenorate afore 1868. The Roushie name wis no acceptit bi Azerbaijanis who continued tae caw the ceety Ganja. In 1918, Ganja became the temporary caipital o the Azerbaijan Democratic Republic, at which pynt it wis renamed Ganja again, till Baku wis recaptured frae the Breetish backed Centrocaspian Dictatorship. In Aprile 1920, the Red Airmy occupee'd Azerbaijan. In Mey 1920, Ganja wis the scene o an abortive anti-Soviet rebellion, durin which the ceety wis hivily damaged bi fechtin atween the insurgents an the Reid Airmy. In 1935, Joseph Stalin renamed the ceety Kirovabad efter Sergei Kirov. In 1991, Azerbaijan re-established its unthirldom, an the auncient name o the ceety wis gien back. For mony years the 104t Guards Airborne Diveesion o the Soviet Airborne Troops wis based in the ceety. The economy o Ganja is pairtially agricultural, pairtially tourist based, wi some industries in operation. Ore minerals extractit frae nearbi mines supply Ganja's metallurgical industries, which produces copper an alumina. Thare are porcelain, silk an fuitwear industries. Ither industries process fuid, grapes an cotton frae the surroondin fermlands. The ceety haes ane o the lairgest textile conglomerates in Azerbaijan an is famous for a fabric named Ganja silk, which received the heichest marks in the mercats o neighborin kintras an the Middle East. The ceety haes ane professional fitbaa team competin in the tap-flicht o Azerbaijani fitbaa - FK Gäncä, umwhile kent as Kəpəz Gəncə currently playin in the Azerbaijan Premier League. ↑ Ростислав Борисовч Рыбаков (1995). Восток в средние века. ISBN 978-5-02-017711-6. ↑ Дьяконов, Игорь Михайлович. Книга воспоминаний. Издательство "Европейский дом", Санкт-Петербург, 1995., 1995. - ISBN 978-5-85733-042-5. cтр. 730-731 Igor Diakonov. The book of memoirs. ↑ V.Minorsky. A History of Shirvan and Derbent. ↑ History of the Caucasian Albanians by Movses Dasxuranci, C.J.F. Dowsett trans. (London 1961), chapter 21. ↑ Seyyaf Sednik oqli Pashayev. "The Monuments of Ganja Khanate of the Period form 1606 - 1804". Retrieved 2007-02-16. ↑ John F. Baddeley, "The Russian conquest of the Caucasus", London: Longmans, Green and Co., 1908, p. 67, citing "Tsitsianoff's report to the Emperor: Akti, ix (supplement), p. 920". ↑ Tadeusz Swietochowski (2004). Russian Azerbaijan, 1905-1920: The Shaping of a National Identity in a Muslim Community. Cambridge University Press. ISBN 978-0-521-52245-8. ↑ Charles van der Leeuw (2000-07-04). Azerbaijan: a quest for identity : a short history. Palgrave Macmillan. p. 124. ISBN 978-0-312-21903-1. ↑ "World Weather Information Service – Ganja". United Nations. Retrieved 19 January 2011. Wikimedia Commons haes media relatit tae Ganja. This page wis last eeditit on 23 Apryle 2018, at 04:56.